Case Study:How ex-MD of Kotak Mahindra turned into an entrepreneur launching e-commerce platform Nykaa? Home > Blog > Blog > Case Study:How ex-MD of Kotak Mahindra turned into an entrepreneur launching e-commerce platform Nykaa? Nykaa is a beauty and wellness e-commerce platform that sells branded products across wide categories of makeup, skincare, hair care, fragrances, bath & body and luxury products for women and men. What makes them different from other beauty e-commerce businesses is their mantra to help Indian women make the best beauty and wellness choices in terms of tools, products, services etc. They’ve a huge collection of fresh and 100% genuine products and services that deliver them all over India.It claims to offer about 300 brands and more than 20,000 products in this category. The portal runs on an inventory-based model and has a warehouse in Mumbai. It has also established strong partnerships with courier companies to offer shipping across more than 900 cities and 9,000 zip codes. The company was founded in 2012 by investment-banker-turned entrepreneur Falguni Nayar and her banker husband Sanjay Nayar. The Nayars had invested $2 million in the company and controlled roughly 95 percent stake in it. Falguni Nayar, ex-MD of Kotak Mahindra Bank founded Nikaa.com when she was looking at various business options, and one trend that she noticed was that unlike other countries like Japan, France and Europe where there are stores like Harrods, Bloomingdale’s or Saks Fifth Avenue offering a number of beauty products and fragrances, India did not have many such outlets. Though there was a demand, there were no suitable retail formats in India. This was when she also observed a US-based multi-brand retailer called Sephora which caught her attention, as it offered customers unbiased advice about multiple brands and products. Thus she was inspired by this, and the fact that there was a large market to be catered to in this segment. Falguni also understood that e-commerce was a more efficient way of servicing a long-tail inventory market in a large country like India. For the reason in the year 2012, Nikaa.com started its operation in India. The company has primarily focused on content. The company feels that there are three types of customers. These are one, customers who are short on time, and e-commerce is convenient. Then there is the beauty aficionado, who knows what she is going to buy. For this bracket of customers, the offering is very wide. Then there are makeup or beauty newbies who don’t know what they are looking for. Hence, the company imparts a lot of education on the website through its online magazine “Beauty Book”. It also has a YouTube channel called Nykaa TV on which they have a number of how-to videos. Various offers and discount coupons are offered to the customers and additional offers are provided at the time of festivals. The company uses social media platform effectively for lead generation and launches various offers to convert it into sales. At present, the Facebook business page has over 4 lacs fans and Twitter witness over 4500 followers. With the lucrative and attracting contents and videos posted frequently, the company has used effectively the social media platforms. YouTube page of the company has around 3000 subscribers. Pinterest has 386 followers and Instagram has over 16.9K followers. Followers on Instagram are increasing in count day by day which is making the business of Nykaa a great shopping experience. They also have videos and content on their product pages. One can see something called Nykaa Decodes where they carry articles and also have experts answering online.Nykaa has also launched its first ever offline retail store at T-3,IGI Airport, New Delhi. The company is two-years old and the business was set up around nine months prior to that. The company is witnessing very good momentum in terms of sales and revenues. The gross margins are double or triple the levels that prevail in the market and the company has been very active on most digital mediums like Facebook, Google etc. other than this, the company has partnered with Femina to launch Nykaa Femina Beauty Awards, an annual award show for beauty products. 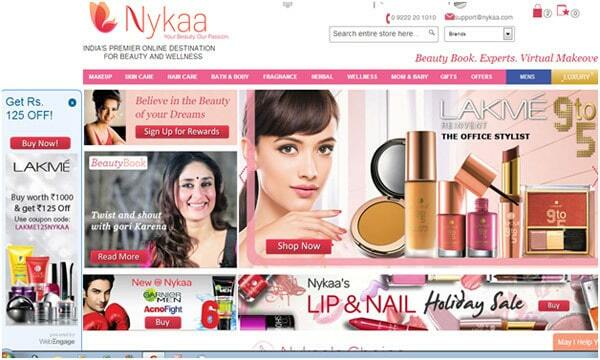 Nykaa, which has 50,000 unique visitors every month, 80% of whom are women, expects its online presence to help grow the physical retail business. Nykaa completed its first round of fund raise in June 2014, raising $3.2 million from a consortium of influential Indian investors and is tying up its second round of funding for these initiatives and expects to raise about $10 million. “We already have one 350 sq ft. store in Delhi’s domestic airport, T3 and will be looking to open another three to four destination stores of about 1,000 sq ft. each by the end of 2016,” Nayar said. The company is also planning to launch its own private label and there will be a couple of brands under Nykaa’s ownership, basically riding their distributorship. At some stage the people do need vitamins and supplements to maintain their looks. So the company is looking at an integrated approach to beauty, which is not just about hiding or enhancing something, but also long-term sustenance. Also, Nykaa wants to bring beauty into style. Fashion and style has dominated the Indian scene in the last five to ten years, but beauty is equally important and Nykaa wants it to get its fair share.